When I was a little girl I made a house for my dolls on the bookshelves in my room. I made the furniture and even made clothes for my dolls. I guess now that I have a little girl of my own, I am dreaming of things I never had. I was excited to discover Gummy Lump, an online store full of classic toys that make me nostalgic about childhood. They have an extensive selection of Melissa and Doug toys and we were sent the Furnished Doll House to review. Mellisa & Doug Furnished Doll House Highlights: Baby E really enjoys her new doll house. It is the perfect size for her and I anticipate she will grow with this toy for quite a few years. It's great how classic toys never become obsolete unlike most toys that flood the market today. It was easy to assemble even for someone who is assembly challenged like me, it took all of half an hour. Everything you need for assembly comes in the box. My daughter was watching me as I put it together and was 'helping' me by handing me parts (and trying to sit on the house before it was completed!). Some of our favorite features are the handle on top, so it is easily portable around the house. We constantly move it around since our living room serves many purposes. I appreciate the fact that it is very simple and leaves more to the imagination. The removable foyer and balcony are a big hit, my daughter loves to take it off and can almost place it back herself. She loves the sliding doors as well. It is very well made and I anticipate it would be passed down to my grandkids if we live till then. It comes with all the furniture for a living room, kitchen, bedroom, and bathroom. Plus you get a family of four to go along with that. We actually accidentally received two boys (as seen in photo) instead of a boy and girl, but my daughter doesn't seem to mind. She just calls them 'children' or 'babies'. I think the best time to introduce a doll house like this is around two and a half to three years old. Baby E is almost two and she did get a little frustrated when her clumsy little hands knocked things down and she couldn't quite seat the dolls or make them stand by herself (them have bendable legs and arms). Guess what? 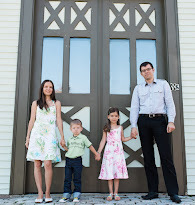 The house is not pink! Now that's something to be excited about! My sister's four boys came over to play and even they found the little house fascinating. It doesn't look at all girly, so it is perfect for group play for all genders. Store Values: Gummy Lump offers toys and products in any price range. Melissa & Doug makes some of the most affordable wooden toys. For example, the Melissa & Doug puzzles are priced at about $6 to $16. You can also get 'higher end' wooden puzzles by other brands for under $30. The Furnished Dollhouse that we reviewed normally retails for $119.99 and is currently on sale for $95.99 with free shipping! Website Design: I love the way their selection is organized on the website. You can easily locate food play toys, pretend play, special needs toys (including gifted children), sleep toys, and best selling toys to name a few. You can also shop by brand if you know what you are looking for. Items offered in the store: Gummy Lump carries the full collection of toys by Melissa & Doug, Kidcraft, and Guidecraft. In addition they have many other popular brand names such as Haba, Green Toys, Educo, HaPe, and Automoblox. The selection of wooden toys is absolutely mind boggling! Here are a few of our favorite things pictured on the left (top to bottom): Quadrilla Melody Basic Set ($79.95), Haba Toys Biofino Vegetable Basket ($24.95), and Haba Indian Summer Wooden Magnetic Pattern Blocks ($44.95). Who Would You Recommend this to? I recommend Gummy Lump if you are looking for children's toys for any age, especially classic and wooden toys. Gifts for any budget! They have an excellent Gift Wizard if you are not sure what to get. Gummy Lump is generously giving Eco-Babyz readers a chance to win their own Melissa & Doug Furnished Dollhouse! 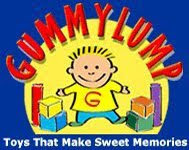 MANDATORY ENTRY: Visit the Gummy Lump website and tell us what is your favorite product. 2. Sign up for the Gummy Lump newsletter (scroll down to bottom of page to Join Our Newsletter). 3. Like Gummy Lump on Facebook. 4. Follow Gummy Lump on Twitter (let us know your twitter name). 5. Buy something from Gummy Lump (purchases will be verified). Contest ends at 11:59 pm on Tuesday, December 14th 2010. Winner will be selected using Random.org and contacted via email. Open to US residents 18+. Disclaimer: I did not receive any payment for this review. I was provided a sample of the product by Gummy Lump for review purposes. The opinions are solely my own and your experience may differ. The Construction Building Set in a Box by Melissa & Doug looks great. I like the Melissa & Doug slice & bake cookies. I like Wooden Railway Train Set by Melissa & Doug. My daughter would love the Card Tricks Unshuffled Magic Set. I signed up for their news letter! I follow you on Twitter~! Voted for you n the picket fence! I really like the Decorate Your Own Pirate Chest Wooden Craft Kit for Kids by Melissa and Doug!My son is really into pirates since we moved to the beach! The 100 pc My Unit Blocks Wooden Building Set with Accessories & Crate would be a lot of fun. I like the Construction Building Set in a Box by Melissa & Doug. I get the gumpy lump newsletter. I like the band in the box set. i l ike the me lissa and doug pizza party kit! voted for you on top baby blogs! voted for you on picket fence blogs! The Construction Building Set in a Box by Melissa & Doug looks great! I like the Art Easel. I like the Red Plasma Car. One of my favorites, besides this awesome dollhouse, is the Guidecraft Solid Wood Kitchen Island Complete Play Center. I receive the Gummy Lump newsletter. Voted for you on the Picket Fence! I liked SET-Pay Food Set #3. My granddaughter loves pizza so this would be fun for her. Voted for you on PFB. I love the play food sets. There are so many great products on Gummy Lump site! One of my faves is the Melissa and Doug Puppet Theater. Thank you for the opportunity! Signed up for Gummy Lump's newsletter! Like Gummy Lump on FB! Following Gummy Lump on Twitter! Following Eco Babyz on Twitter! The Autoblox cars are neat but This doll house is what I really want.My niece would just love this so much! Thanks! Trunki Terrance Blue Kids Suitcase by Melissa & Doug is my favorite. I Like Gummy Lump on Facebook. I follow Gummy Lump on Twitter @susanlanai. I follow Eco-Babyz on Twitter.